American billionaire businessman and TV personality Donald Trump was in Scotland today to officially open the brand new clubhouse at his stunning Trump International Golf Links venue just outside Aberdeen. Trump welcomed VIPs, dignitaries and press to the substantial granite building at a ceremony to mark the momentous occasion. Since opening the championship course in July 2012, golfers have been serviced in a temporary facility but can now enjoy the splendour of the classy new clubhouse. Designed with both golfers and non-golfers in mind, the new Clubhouse provides a range of luxury facilities including Restaurant, Bar, Shop, Lounge, Private Dining and Event Space, Locker Room and Snug areas. Andrew McNair, Director of the architectural firm Covell Matthews said “Mr. Trump had a clear vision to create a Clubhouse that embraces the existing vernacular style as exemplified in MacLeod House, the architectural centre-piece of the golf resort. 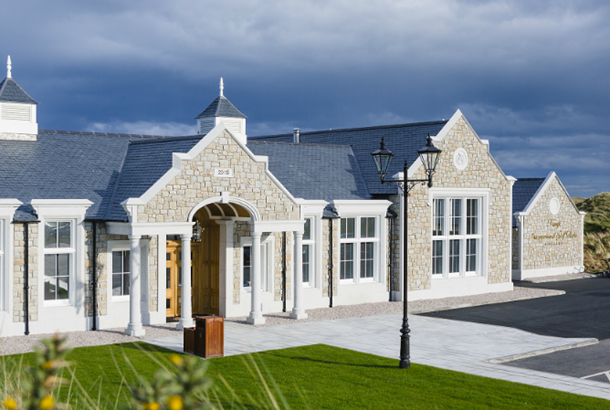 The new Clubhouse boasts traditionally detailed slate roofs, rubble granite walls and feature sash and case windows”. The new Brasserie Restaurant is a comfortable, relaxed environment at the heart of the Clubhouse. With beautiful rich walnut, leather seating, warming fireplaces and floor-to-ceiling windows offering stunning views, guests can enjoy a range of classic dishes and familiar favourites all created using local produce. In the North wing, The Snug is a cosy retreat featuring deep, oxblood leather chairs and an enormous fireplace perfect for indulging in a wee dram and ideal for intimate, private dinners or events. The Shop is a new premium retail experience not just for golfers – featuring the latest designer pieces for fashion that looks as good off the fairways as on plus a new and exclusive range of Trump sweaters and hoodies.